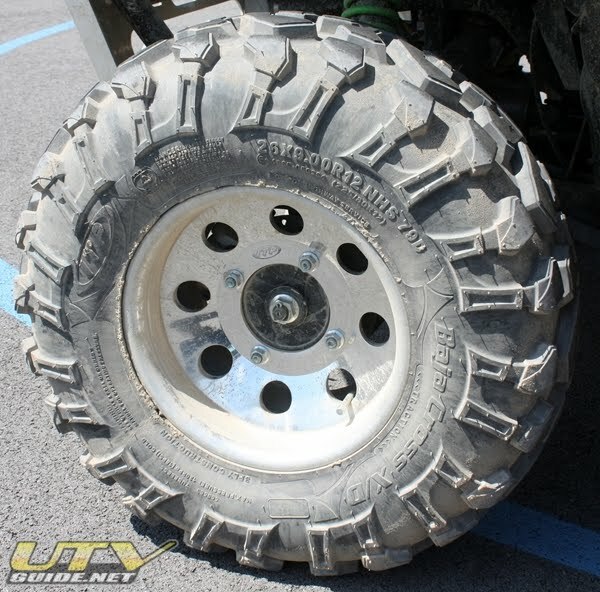 Following on the success of their Baja proven BajaCross UTV tires, ITP has just added 26x9R-12 and 26x11R-12 sizes. BajaCross tires have an 8-ply rating and 25% stronger construction that has resulted in a high level of durability. Our extended-life rubber compound and innovative overlapping tread pattern provides a smooth, predictable ride as well as slow wear characteristics — this is the highest-mileage tire ITP has ever produced! Stepped lugs provide consistent tread edges as the tire wears, for predictable performance throughout the long life of the tire. Wraparound lugs provide improved shoulder protection, while a super deep Rim Guard feature offers the best wheel lip protection in the business. Despite its strength, the BajaCross’s advanced carcass design delivers the most comfortable, trail-compliant ride available.